We learnt a new technique at homeschool group this morning. The people at Cairns Regional Art Gallery let our group have a go at the wax resist painting technique as part of our gallery tour. It’s always good to try out new methods of expressing yourself and creating beautiful things. This technique is simple enough for even tiny children. It’s great to mention specific techniques you’ve explored when reporting time comes around, too. For older children you could talk about the science involved, wax (oil) and water don’t mix ( they are not miscible), the wax crayon repels the water paint so the design made in wax crayon will not be masked by the paint. All you need are some wax crayons and some very dilute water colour paint. 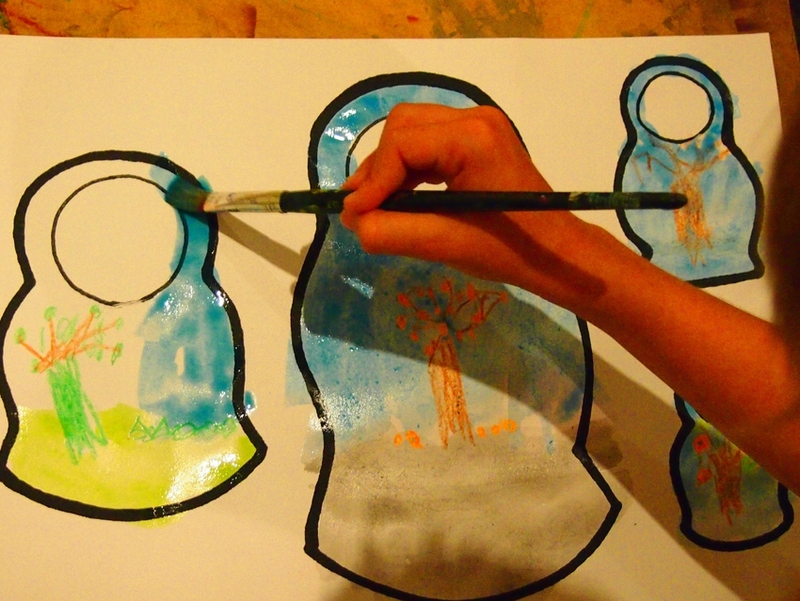 Simply draw your design in crayon the wash over it with the paint. Leave to dry. That’s it. 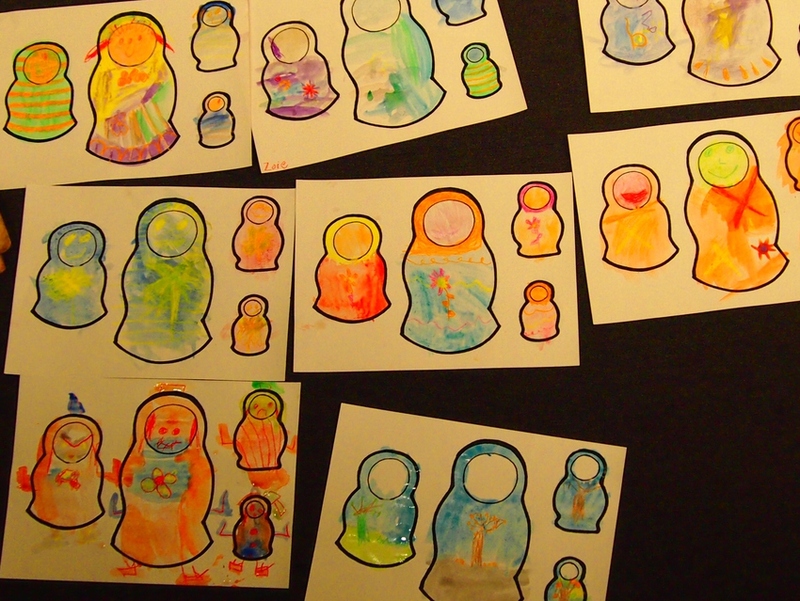 The children used outlines of matryoshka dolls to decorate today, so they learnt a little about Russia, too. 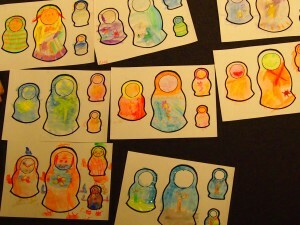 These nesting dolls are often called babushka dolls, that’s actually incorrect. 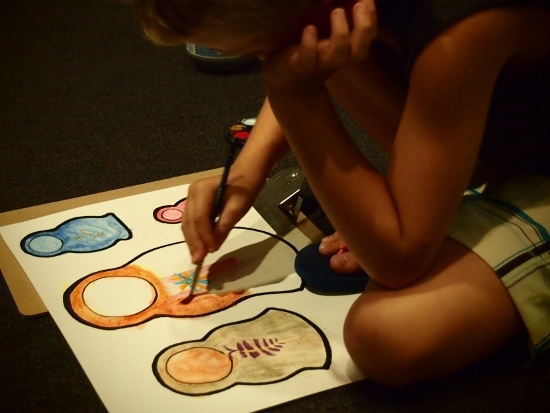 children of all ages designed their own wax resist painting. Next time you’re at home with some spare time, break out the paint and the crayons, the children will have fun and you’ll have the wax resist painting technique crossed off your curriculum! Good to know that they are not babushka dolls – that is a scarf or old woman it seems. Maybe we should let the art gallery know.